“Ready to Dance and Other Poems” is a poetry book that not only shares of fictional events, but also is based off of the author’s experiences. Rooke hopes that readers can understand the emotions of loss, triumph, joy, tragedy, and celebration through the characters in his book. “After my retirement, I wanted to compile some of thoughts I had and shape them in my own ends,” Rooke said. 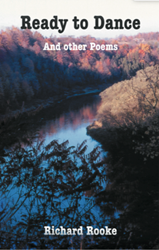 “Ready to Dance and Other Poems,” is not only a poetry book that is filled with many emotions, but it allows the reader to examine that heaven is always around them as long as they keep their eyes open. Time is a great traveler and everyone is on his or her own journey. By reading “Ready to Dance and Other Poems,” individuals will understand purpose and appreciate poetry never before. Richard Rooke, a former English professor, is the author of eight books including, “Ready to Dance and Other Poems.” Throughout his writing, Rooke shares many poems that are based off of his life in fictional settings. Rooke currently resides in Canada and enjoys writing and reading poetry.